Our program this month was an enjoyable lecture from Karla Alexander We so enjoyed her enthusiasm and knowledge. 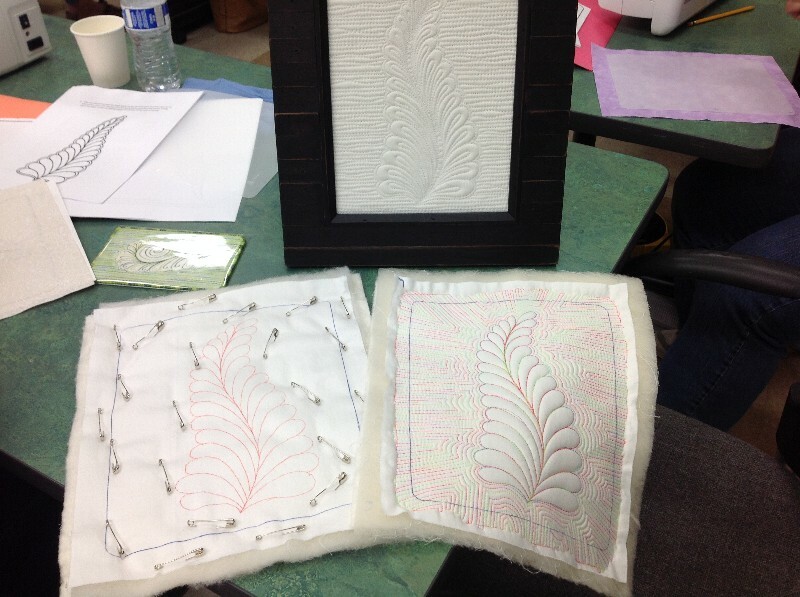 Her quilts and techniques are suited for everyone at any level of quilt making. This month was also the completion of the music challenge. 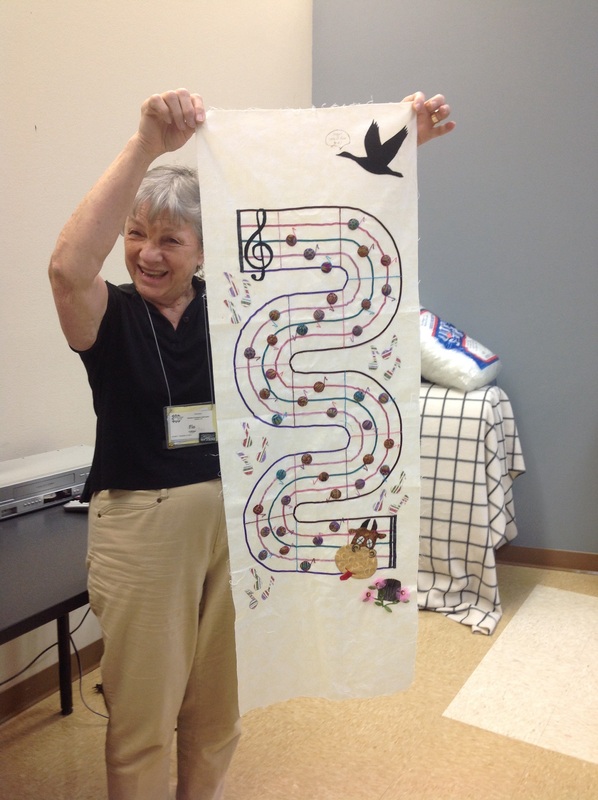 The challenge was to choose a song and compose a quilt that reflected your thoughts about that song. 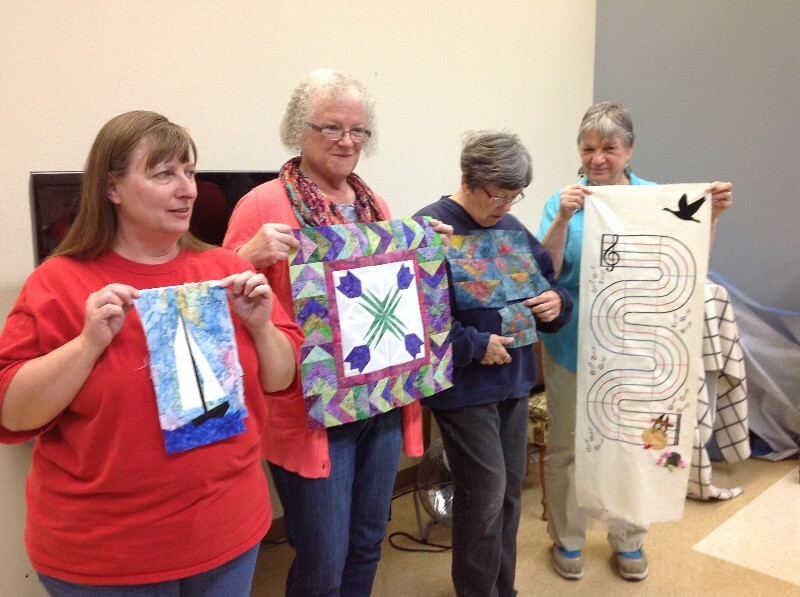 Flo, Shirley, JoAnn, Carol, Teresa please post, in the comments section, what your song was and talk about how the quilt reflected your song. 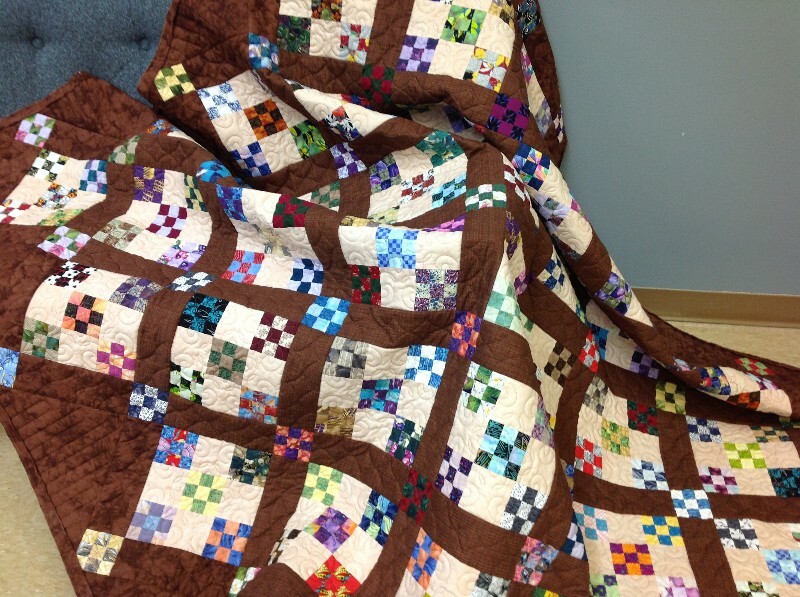 Next month members will have an opportunity to purchase a chance to win one of these little quilts. The Goose is finished, the Cardinal is currently having another round put on it but all will be ready by our meeting. Show and tell. Lots of fun quilts and Jean’s baskets. Click on any picture to be taken to a full screen view and you can scroll thru the photos. Another great meeting, wish you were here! 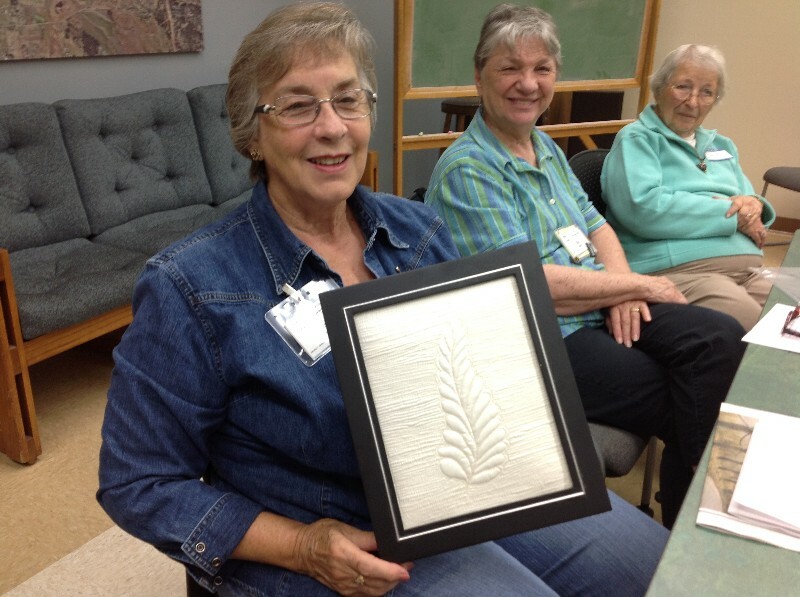 Last month, Martha Briese showed everyone her method of making small quilted feather pieces for framing. Marie, Flo and Sharon brought in their completed project. Martha’s is framed with a postcard. The last picture I believe is Teresa’s. 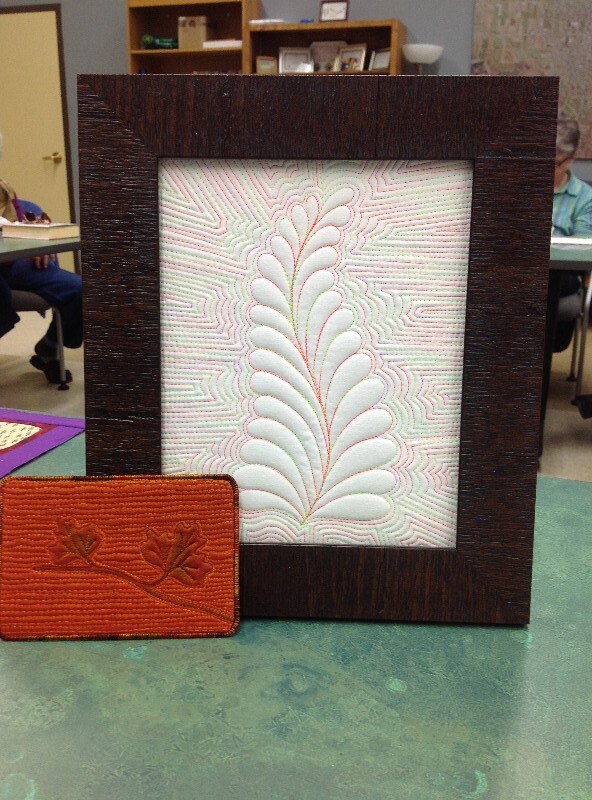 Carol showed her variation of a bargello. 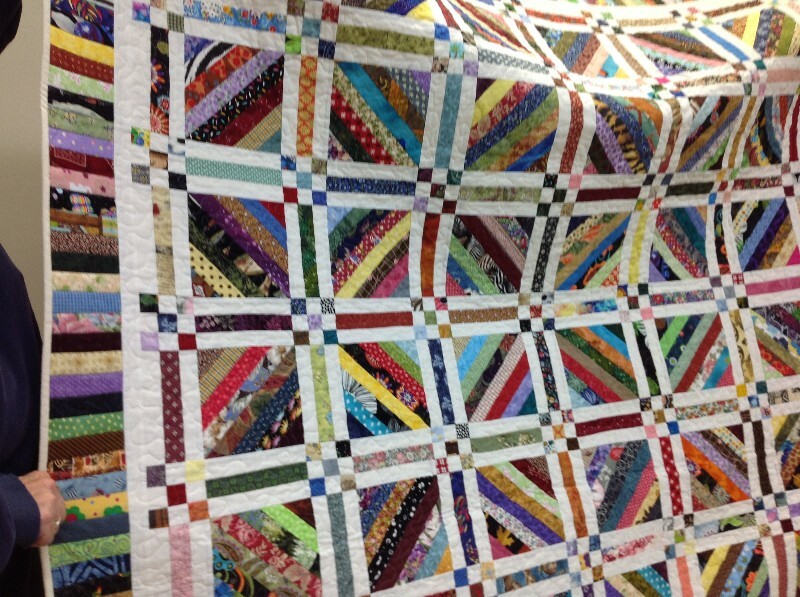 October program is Karla Alexander, Lift Your Quilts Out of Your Stash. Karla is always an entertaining and informative speaker so don’t miss this meeting! Another fun day with fellow quilters. If you missed it, we missed having you. Put next month, September 26th on your calendar. 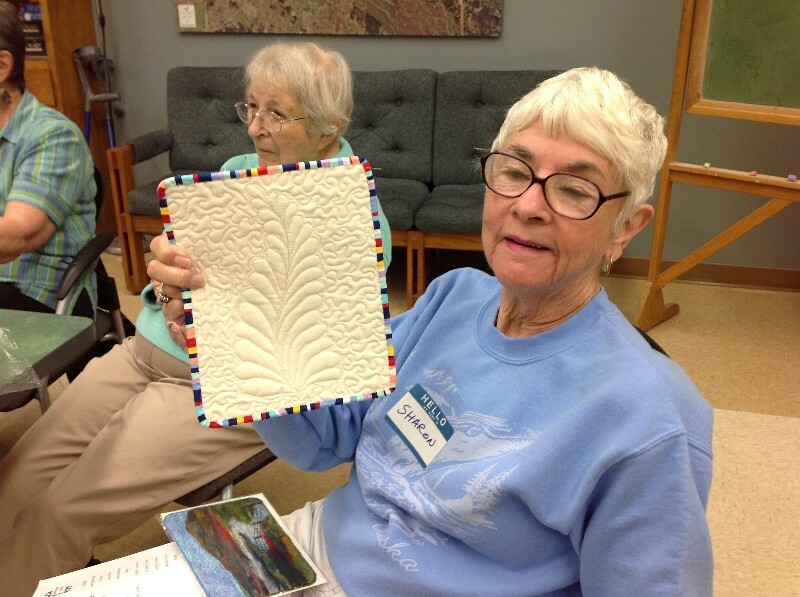 As many of you know, Shirley Kerr has moved to the Portland area but she came down to the meeting and showed us how she used the memory blocks we all made and gave her. 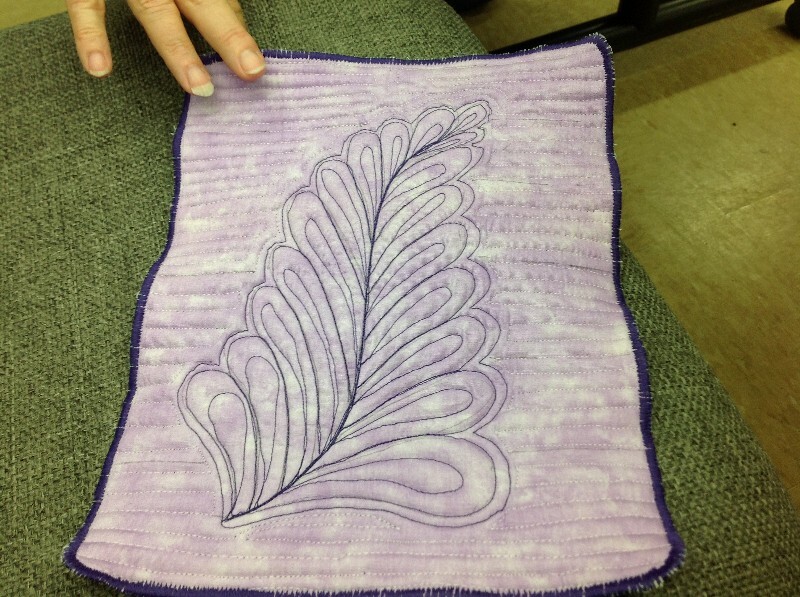 Martha Briese gave us a great program on quilting feathers of your domestic machine. Her work is wonderful and her presentation certainly got everyone exciting about practicing. 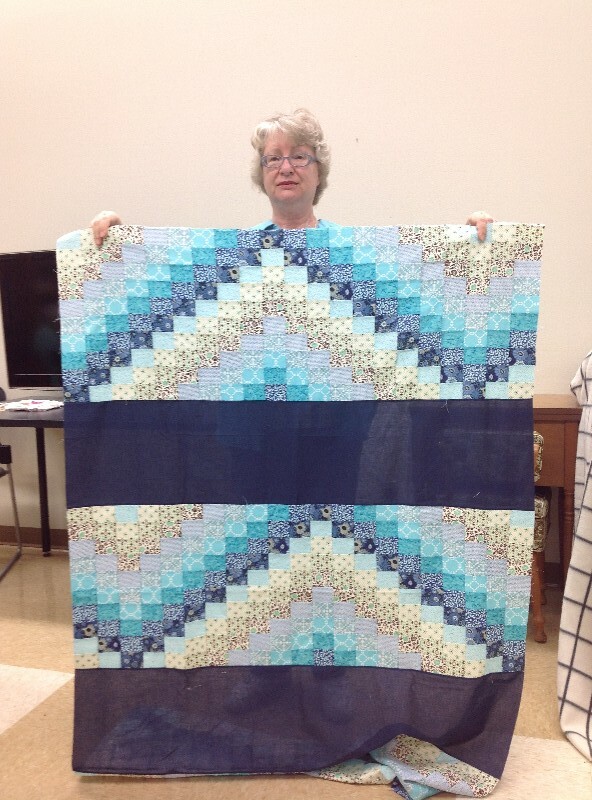 Be sure to check out her blog to see all her amazing quilts. Show and tell. 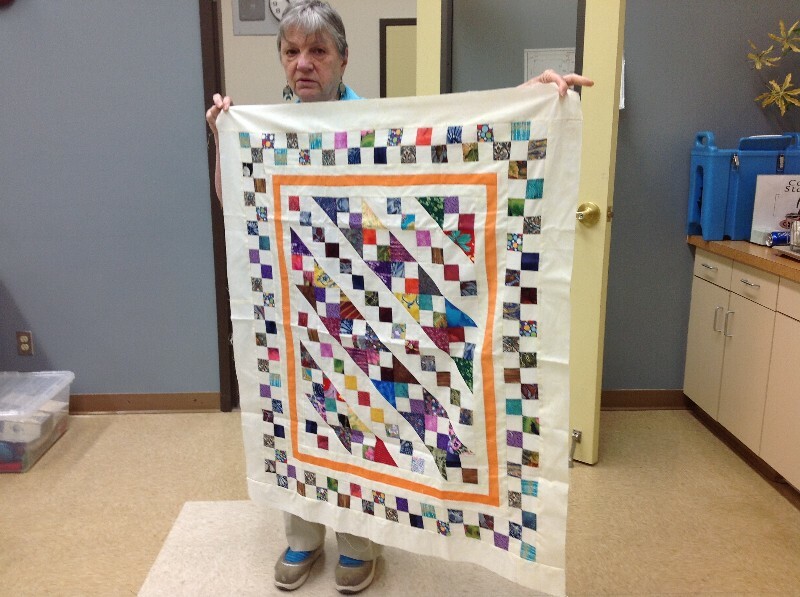 Shirley brought her almost finished challenge quilt and a stuffed bear made with leftover strings. Flo up-cycled some orphan blocks into 5 very pretty pieces. 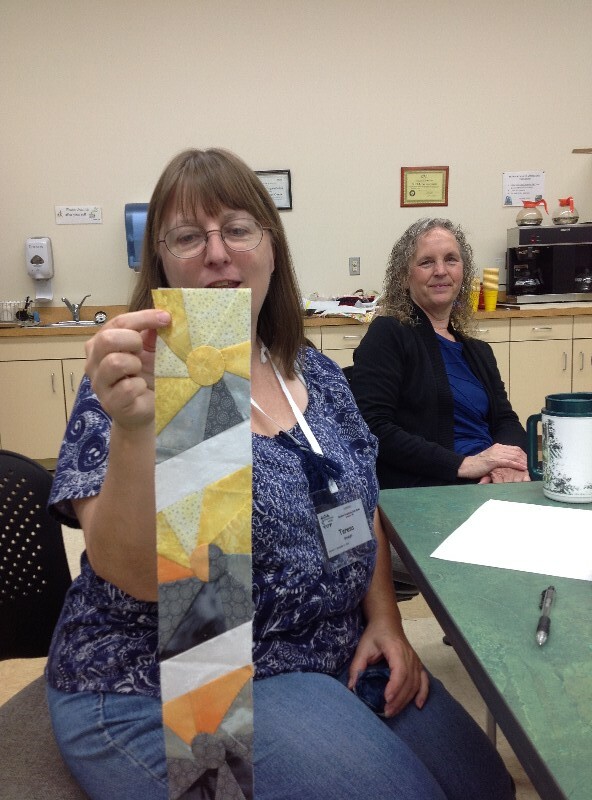 Today’s program is Martha Briese telling us her method for using up left over dibs and dabs of fabric from prior projects, use of orphan blocks, storage of scraps and strips. Here are a few members renditions of their scraps and orphan blocks. So far only Flo is keeping up on the challenge. Be sure to read the song. 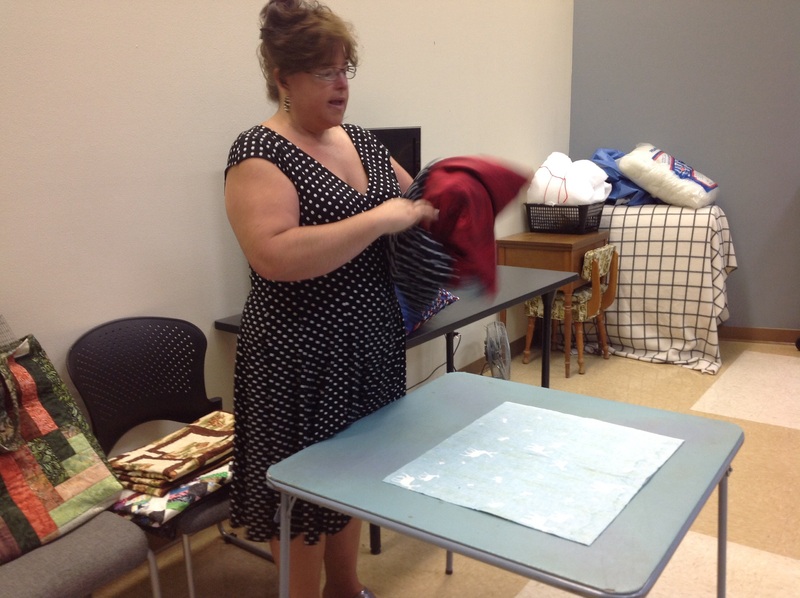 This month we had the pleasure of having Paula Lammert of Finally Together Quilt Shop come to our meeting. 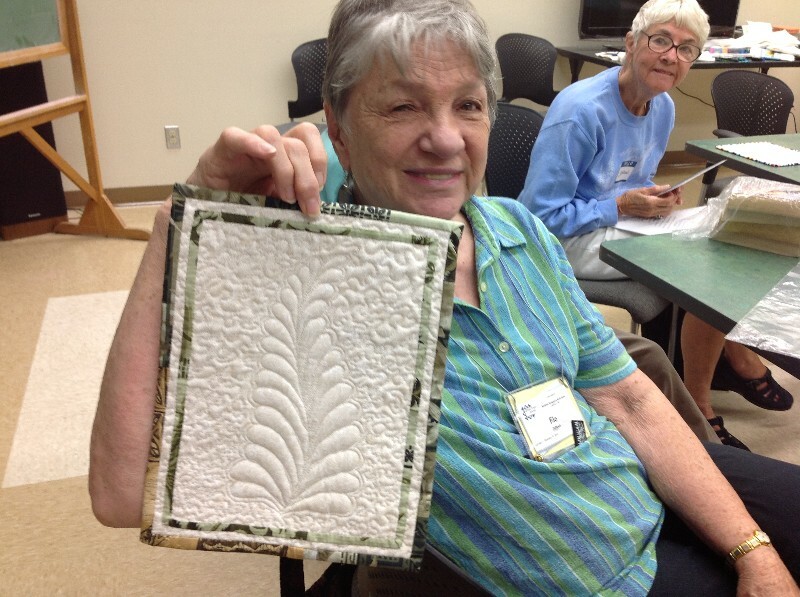 Paula showed us how to make fat quarter pillows and demonstrated how to use these very cool rulers for making leaves and stems. 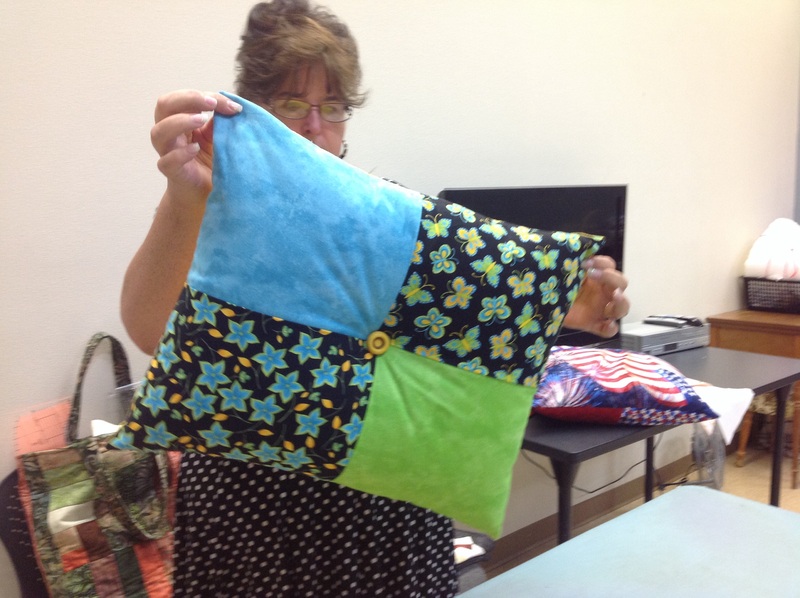 Now, I wish I would have taken a video, but here is Paula showing us how to fold the fat quarters, take a couple of seams, turn it inside out and add an optional button. Fits a standard sized pillow. Stop by the quilt shop if you need for info on this simple technique. These rulers, Leaves Gallore, are used for cutting stems and leaves or tracing around for beautiful curves. We are all falling behind on the challenge except for Flo. Starting to look pretty cool! Show and tell, our other favorite part of guild! 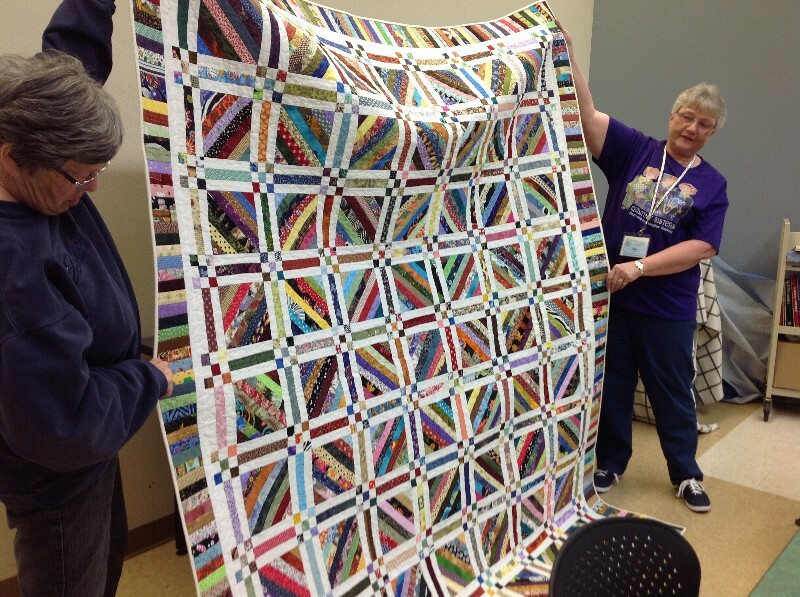 Don’t forget June is our annual potluck lunch and June program is Paula Lammert from Finally Together Quilt Shop. Show and tell. Very talented ladies in this group! 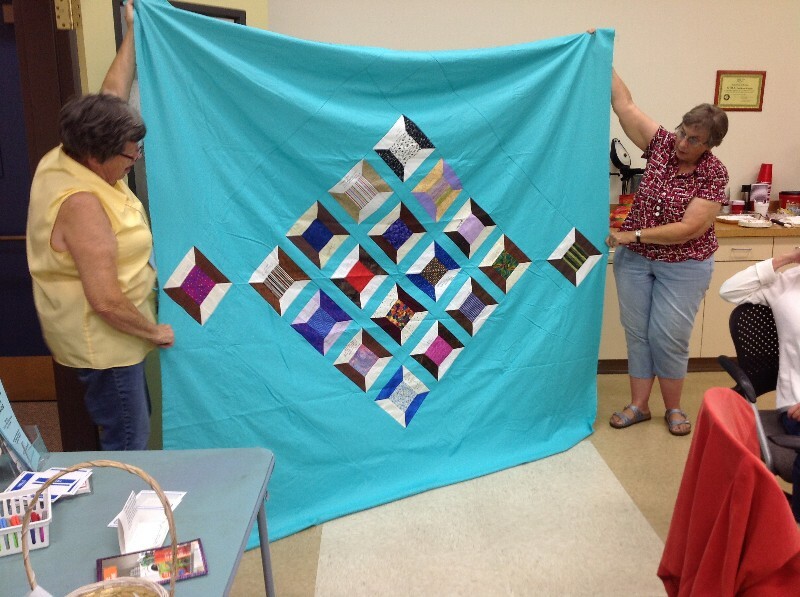 Yet another fun day with fellow quilters. 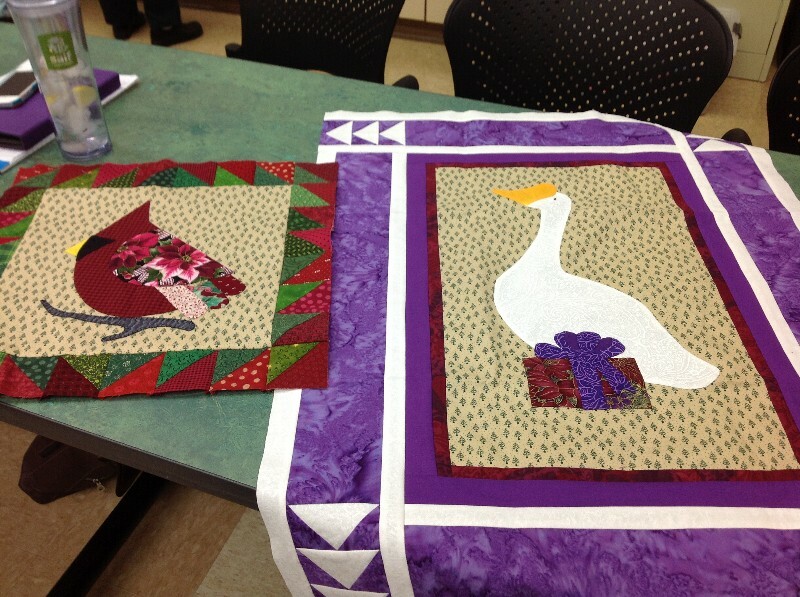 Here is the progress on the challenge quilts. It looks like there aren’t many participating but actually, everyone is just working on to many projects at once and getting a bit behind! 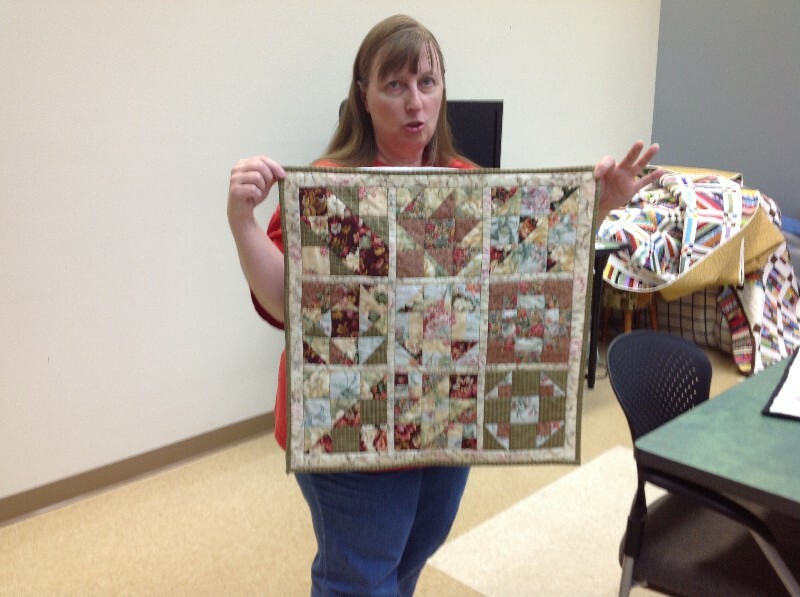 Show and tell….. Alice made a couple of fun scrappy quilts. 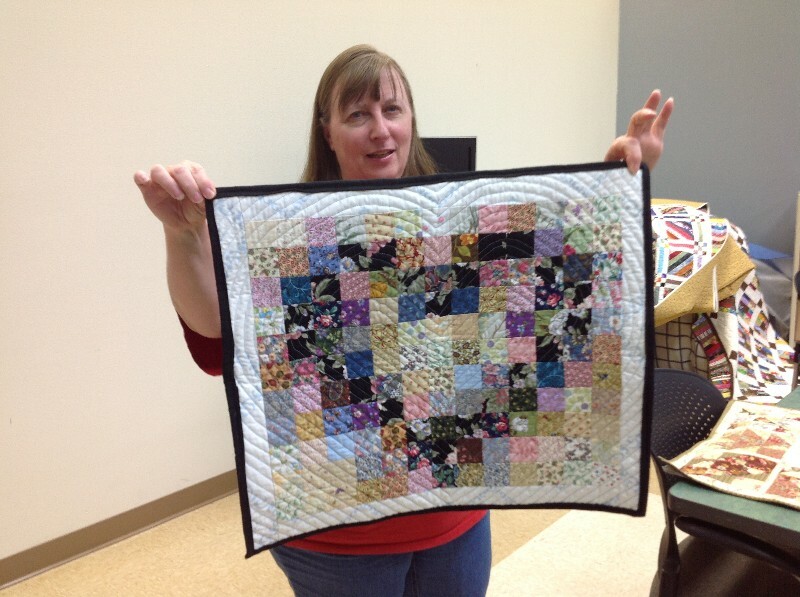 Teresa’s little sampler and heart quilt. 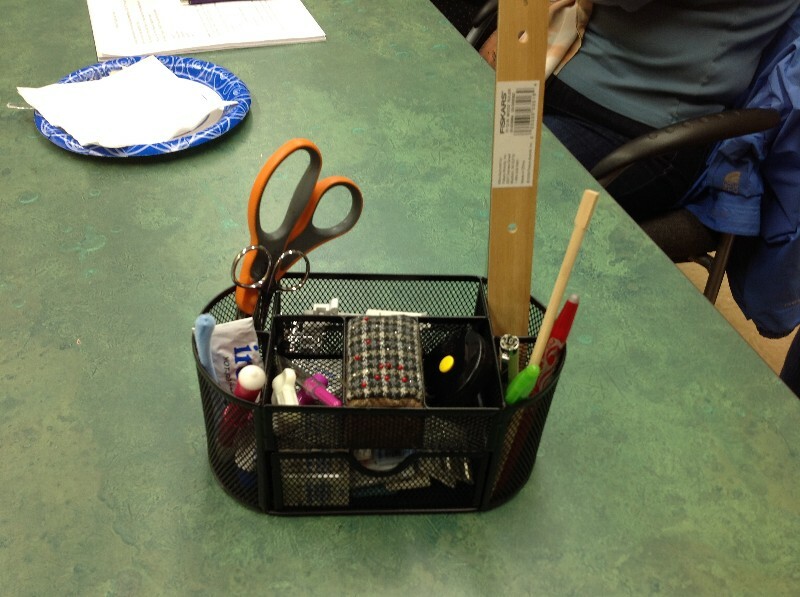 Martha’s new organizer. I think we all need to do this. Jean and Flo’s leftovers quilt. Left over half square triangles and two patches.